Tera Jurrens graduated from Ohio State University with a Bachelor’s degree in Animal Science and minor in Disability Studies in March of 2011. She was a puppy raiser for Canine Companions for Independence since 2003. She has raised 9 total dogs, 7 of those dogs are currently working as assistance dogs. 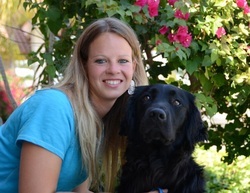 During her four years of college, Tera worked at Canine Companions as a kennel technician and apprentice instructor. She enjoys competing in AKC dog sports, during her free time. She is currently competing in the top levels in AKC obedience and agility with her Sheltie. She also trains in herding and agility with her Border Collie. Tera most recently worked at Bergin University of Canine Studies under Dr. Bonnie Bergin (the founder of Canine Companions and the service dog concept). At Bergin Tera taught students how to train their assistance dogs in obedience, service dog tasks, and hearing dog work. Tera began realizing that there is a growing need for assistance dogs. She then made a tough decision to leave Bergin University to create Freedom Paws Assistance Dogs. Tera believes that each dog should be individually trained to meet their own learning style. No one dog learns the same way. She also wants to provide clients assistance dogs that are trained to meet their every need.